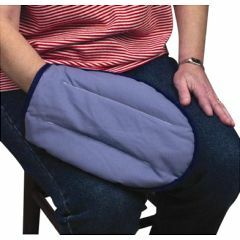 The Therabeads Moist Heat Mitt helps relieve pain and stiffness associated with arthritis. Microwavable, reusable. Fits right or left hand. My fingers turn white and get very cold. This glove warms my finger quickly and relieves the pain. Having broken my wrist I can easily use it prior to starting my rehab exercise routine. I would like to purchase 2 Thera-bead mitts. do you ship to australia and if so what would be the shipping rate? You can make one by sewing thin washcloths together and stuffing with whole grain rice -- do not use "minute rice" -- it is microwavable. The mitt is fine. Needs longer microwave time then specified, but works well. The moist heating pad is half worthless. To be moist requires requires manipulation of fragile articles before and after each use and can be dangerous if there is any flaw in the pad itself. The heating pad without moisture is OK.